Chicken meat production uses evaporative cooling in the grow-out sheds to cool the birds during warm weather. It is an effective method of cooling, but uses a lot of water and also increases the relative humidity in the shed. High relative humidity negatively affects the bird’s ability to deal with heat and may also contribute to increasing the litter moisture content, which by association may affect some aspects of flock health and welfare. A recently developed technology that reduces the need for conventional evaporative cooling, with evaporative cooling pads or high pressure foggers, is in-shed sprinkler systems, which intermittently apply relatively small quantities of water directly onto the birds at regular intervals. Previous studies have shown that these low-pressure sprinklers are effective for cooling birds and improving litter conditions, while using much less water. This study is the first for trialling this in-shed sprinkler system on Australian meat-chicken farms. In this study, Effect of an in-shed sprinkler cooling system on temperature, relative humidity, water usage, litter conditions, live weight and mortality, sprinkler systems reduced cooling water usage. When consistently used, cooling water usage was reduced by 56% over a one year period. The sprinklers had practically no effect on litter moisture content, bird live weight or mortality. When sprinklers were operating, in-shed temperature was warmer compared with the control sheds, but relative humidity was lower. Birds appeared equally comfortable. 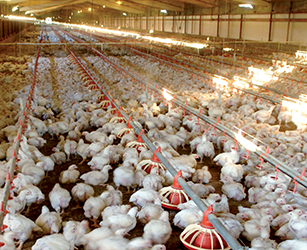 In-shed sprinklers may not be suitable or desirable at all meat chicken farms, but may be beneficial for farms with limited water supply, or where water is difficult or expensive to treat. This sprinkler system is less expensive than other methods of evaporative cooling and uses robust and readily available components, which may make it desirable for a secondary or back-up cooling system. This project was funded from industry revenue, which was matched by funds provided by the Australian Government. The complete study is available from AgriFutures Australia.